Since yesterday my Pings have doubled from ~30 to over 60... Maybe the bad weather? Can someone else please check their pings? Trial for what? Could I be on same trial? And you won't be on this trial as its not ran by an ISP nor do I report to one as it stands. 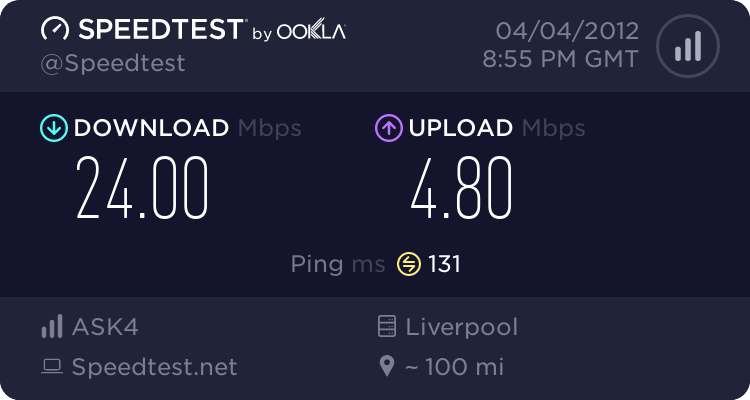 I've had a few goes on SpeedTest.net tonight and my ping times have also doubled since last week. 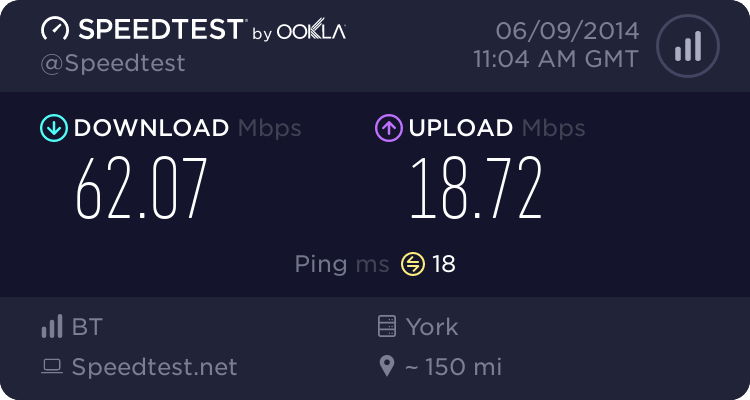 I'm now averaging between 70-80ms. What is the theory behind this sudden drop in speed? Should we be concerned? I'm happy to participate in more testing if it will help. 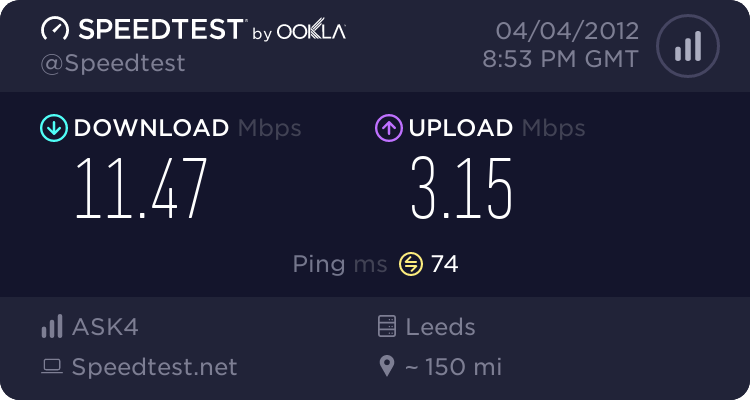 (05-04-2012 11:58 PM)Rigsby Wrote: I've had a few goes on SpeedTest.net tonight and my ping times have also doubled since last week. 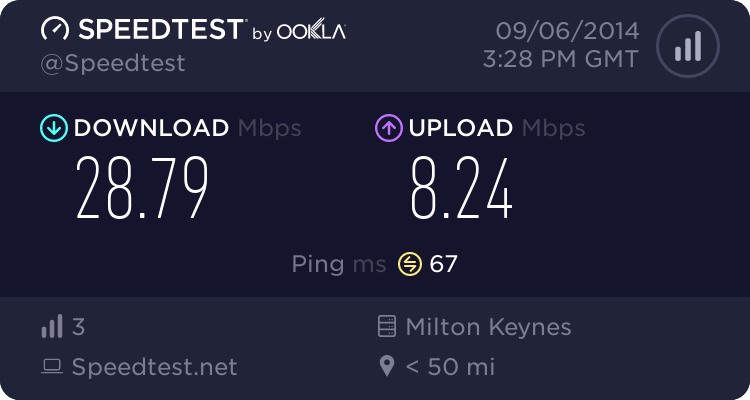 I'm now averaging between 70-80ms. Ah cheers for the reply. Looks like im not the only one then... Hmph. Has anyone officially reported this to Ask4 yet? They appear to be awful quiet in here at the moment. I have just reported the issue to support@ask4.com however I am going away for the weekend. I will try and update if I get a response during the weekend. The first 'hop' used to be 18ms. I am now awaiting a response from them but it is interesting to know that others are also experiencing this problem as I thought it was just me.